You've heard me rave about Munchery many times by now, so often that I have a label on this blog devoted to it. But a quick recap: meal delivery service, curated group of chefs, well designed web site, delivery tracking, etc, etc. Munchery is open only for dinner, so I mainly use it to order entrees, like my absolute favorite meal so far, the stuffed shells from Chef Bridget Batson. But, they often have breakfast items on the menu. I was pretty skeptical about ordering a baked good the night before, as I'm a bit of a snob when it comes to baked goods, and generally consider muffins or scones that are even just 2 hours old to be not worth eating. But a few months ago, I threw a blueberry bran muffin on to my order, and ended up loving it. Chef Bratko is the owner and self-taught pastry chef of Beyond Buttercream, which caters mostly cakes for weddings and other special occasions. They have no physical storefront. However, Munchery often features her scones and cakes. This wasn't my first encounter with her treats, which is another reason I was willing to risk it and order a scone. I knew she makes amazing things, as she was the one who made the insanely delicious pumpkin pie cheesecake we had to go along with our full Thanksgiving dinner from Munchery in November. If you are interested in Munchery, for a full meal, desserts, or even just baked goods, use my invite link, you'll even get $20 off your first order! "This is proper traditional UK style scone that is moist, delicious and perfect for breakfast. It has organic poppy seeds and pure lemon oil imported from France, a light and sweet tangy glaze." I was intending my scone to be for breakfast that next morning, but to give it a fair evaluation, I obviously had to try a few bites the evening I received it. I was very skeptical that it would be better the next day, as the chef claimed, so I wanted the comparison point. The first thing I noticed as I took a bite is that it was truly a lemon scone. Seriously lemon-y. If you do not like strong lemon flavor, or tang, or zing, then this is really not the scone for you. The lemon is infused in the scone itself, and is very strong in the glaze as well. I don't actually really like lemon flavor, and would have chosen any other variety if available, so this was a turn off for me, but I clearly can't fault the chef for the scone being too lemony, when it was indeed advertised as a lemon scone. I do wish the glaze was just sweet instead of tangy, but again, only because I don't care for strong lemon flavor, I actually think it is awesome that she amped the flavor up that much. The glaze was applied in just the right amount, enough to accent the scone and make adding jam or cream unnecessary (although, I did still add jam the next day), but not so much that it felt like frosting. As I mentioned, it was very lemony and tangy, but also very sweet at the same time. Overall, the scone itself was also fairly sweet, which pushed it a bit into the realm of dessert rather than breakfast for me. 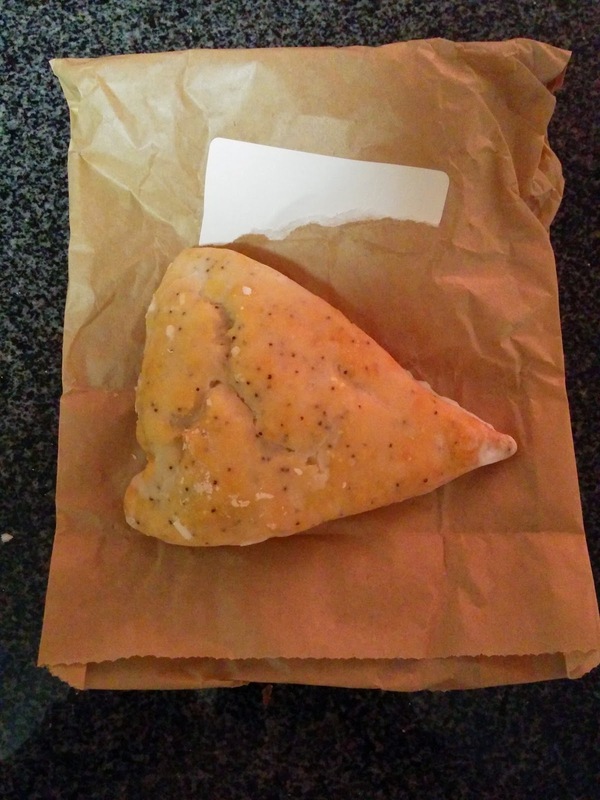 The scone was loaded with poppy seeds, evenly distributed throughout. They added a bit of crunch, and obviously, lemon poppy seed is a common pairing. The base flavor had a bit of tang to it, which I originally thought must be buttermilk, but I actually think was just the lemon. It was very moist, as advertised, but reminded me more of a cake than a scone. I guess I'm just used to the more American style of scone that is drier? Again, it pushed a bit in the dessert direction, due to the more cake-like texture. The next morning, I pulled out my scone, very skeptical. I ate half of it at room temperature, and warmed the other half up in the toaster oven, since I always like warm baked goods. It had changed overnight. I wouldn't say it was better the next day, but it was a bit drier, as you would expect. I prefer a drier style scone, so I somewhat thought that aspect was better, but it still wasn't a crumb style scone. I found that adding some of my mom's strawberry jam helped tame the strong lemon flavor, and did compliment it well. Overall, this was a fine scone, and it did hold up overnight far better than I expected. It was nice to have a breakfast treat waiting for me in my kitchen. If you like lemon, I recommend it. It wasn't my ideal scone, but my experience just makes me want to try some of Chef Bratko's other baked goods. The $2.95 price tag is a bit high for a scone, since most bakeries or coffee shops have them more in the $2.25 - $2.50 range, and once you add on delivery fees it is a very pricy scone, but just like the muffin, it is a reasonable add-on if you are already ordering dinner from Munchery.